It was that time of year again when infamous bloggers Grab Your Fork and Chocolatesuze organised one of the biggest Sydney Food Bloggers Picnic. 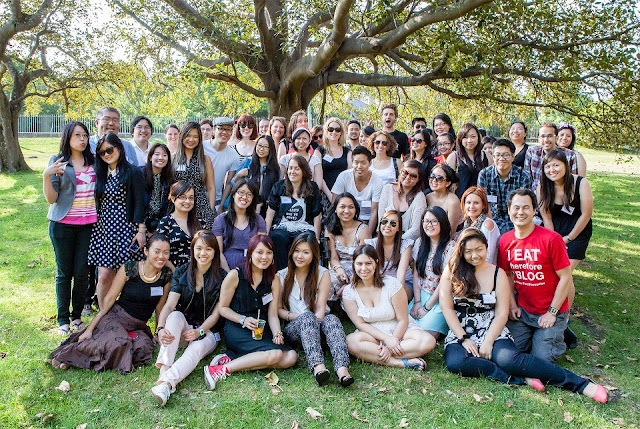 The picnic is literally composed of food bloogers from the Sydney region, who all bring a dish or a drink and have the chance to meet fellow bloggers. It was great to meet new bloggers, and put faces to already known blogs. A highlight would have to be the EVIL Secret Santa, allowing the opportunity to steal someone else's gift. As soon as you steal, you are in for a ride. The Secret Santa definitely allowed us to put faces to bloggers and to see who the evil ones are! This time, I was supposed to make gelatin free marshmallows, but that was a fail result of goo, so as a last resort I had to quickly make some chocolate cheesecake brownie. Chocolate suze won the jelly bear mould, before it was taken from her, and she got another gift she wanted. The KK section is always fun - it's interesting to see which gifts are the most sought-after too! So glad you could come - I managed a small piece of your cheesecake brownie. Deliciously rich! Hope the pizza stone serves you well. HAHAHA dammit i wanted that gummy bear so badly lololol thanks heaps for coming! I have been reading everyones posts about it and am super disappointed that I couldn't make it. Next year! I did enjoy the macaron timer! I couldn't decide between the timer, pizza stone and jelly bear mould! That macaron time was so cute though! Again, thank you and chocolatesuze for organising such a great event! More enjoyable every time! Hahaha, in the end I didn't get the mould either, so karma got me back. I am very excited to use it. So many people did..too many people! I wish you were there, I would have loved to had the opportunity to talk to you! buahahaha it was me that ended up with the cute macaron timer! ^^ but hey everyone else stole everything from me LOL. Great wrap up!